In America, one in four children grow-up in homes led by single mothers. Such was the case for actor/comedian/writer Baron Vaughn (‘Grace and Frankie,’ ‘Mystery Science Theater 3000’) who, with the support of his mother, chose not to let a statistic define him and set out on a quest to search for the father he never knew. 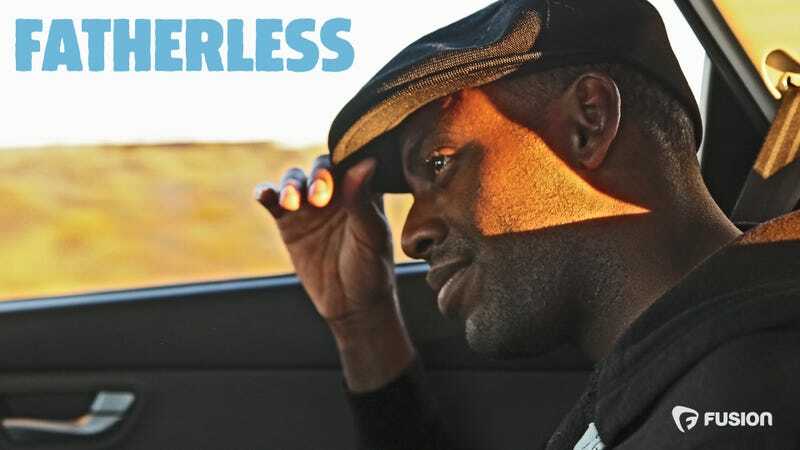 Baron’s journey and the revelations about his upbringing are chronicled with a flair for both the comedic and heartfelt in FUSION TV’s original, one-hour documentary, ‘Fatherless’ premiering Sunday, April 2 @ 9PM ET (channel listings). At age 35, Vaughn has hit his stride professionally, as both an actor, a comedian and a better half to his live-in girlfriend. But there is still one part of his world that feels like a missing link, one person who has yet to experience Vaughn’s success – his real father. In this moving and laugh-out-loud documentary, Vaughn strips away the Hollywood facade and through a mix of truly personal interviews with his mother, friends, experts and colleagues, he illustrates how your circumstances don’t have to define you or hold you back. Raised by a single mother in New Mexico (and later in Las Vegas) with the support of grandparents and great-grandparents, the self-described “professional weirdo” was taught never to harp on the past, but to always look ahead and embrace what the future might hold. In the absence of a father, Baron developed his own construct of the black male identity — primarily a composite of black comics like “Richard Pryor, Eddie Murphy and all the Wayans” — men he saw and idolized on TV and in the movies. With these substitute role models, it was inevitable that he would join the ‘family business’ and become a comedian himself. His comedy often reflected his feelings about the parent gap when he delivered lines in his stand-up routine like “I come from a mixed marriage, a Black mother and a missing father,” but in his heart, he wanted to connect with the man who left his mother before Baron was even born. “The truth is always important to have, even if you don’t like what you hear... it doesn’t need you, YOU need the truth,” said Baron Vaughn. “Learning what I did throughout this process helped me to release a lot of baggage. The sandbags on the hot air balloon of life were weighing me down and I’ve finally been able to cut them off and take off into the sky,” he added with a laugh. “Fatherless” is a FUSION Original Production produced by Big Beach TV and directed by Dawn Porter. Baron Vaughn, Dawn Porter, and Bryan Carmel served as executive producers. Anne Loder served as development director for FUSION TV. Actor/comedian/writer Baron Vaughn graduated from Boston University’s theatre program and immediately went on to the Williamstown Theatre Festival. That same year he was cast in Drowning Crow with Alfre Woodard on Broadway. He was also in Damn Yankees at the NY City Center with Jane Krakowski and Sean Hayes. Baron is a series regular on Grace and Frankie, which will be premiering its third season on March 24 on Netflix. He will also be heard starring as the voice of Tom Servo in the revival of Mystery Science Theater 3000 premiering on April 14 on Netflix. Other television/film credits include Girls, Comedy Bang! Bang!, Arrested Development, Cloverfield, and Black Dynamite. As a comedian, Baron has toured all over the country performing at festivals, clubs and theatres. He has been featured on NBC’s Late Night With Jimmy Fallon and twice on Conanon TBS. He has had a half hour special on Comedy Central, and his newest comedy album, Blaxistential Crisis, is available on iTunes.